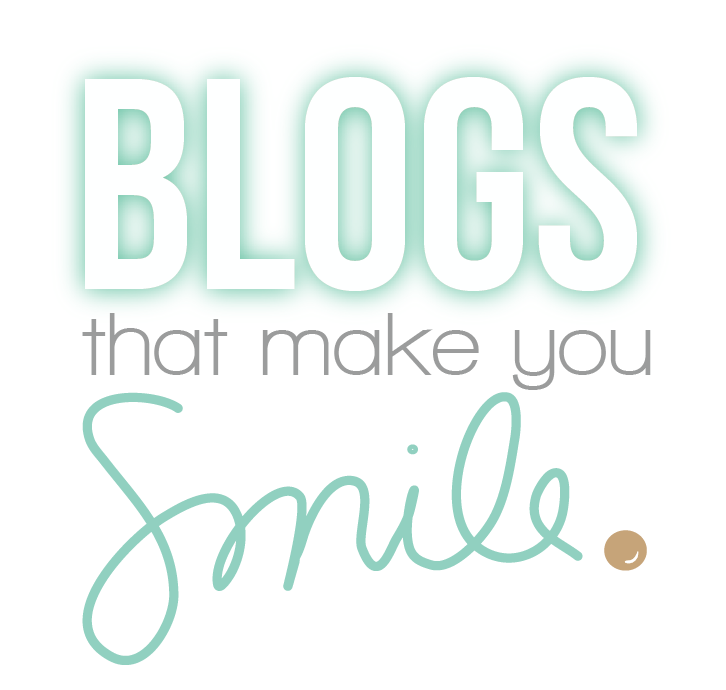 it's time for a new series here on the Create A Smile blog. She makes the most amazing scrapbook-layouts and also wonderful CAS cards. I fell in love with her blog from the first moment I saw it. She takes great pictures of her projects, too! Anja from Switzerland constantly amazes me with her creations. She keeps her designs clean but full of detail - oh how I love this! 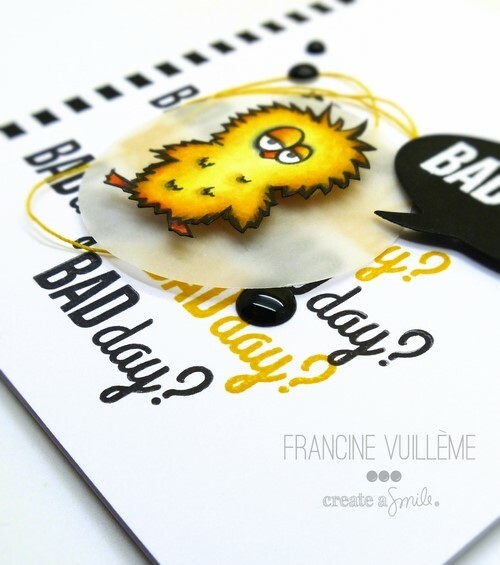 Of course I especially love her creations using our stamps - she makes me love them even more :) Her colouring skills leave me speechless. I'm back with some news tomorrow - hope you have a wonderful crafty weekend. Hey stampers, Anni here! Hope you have a wonderful weekend! Last week I made a card to chase the grey days away! Today my cards fits perfectly the weather outside: it is sunny, there is snow and it is cold in Berlin, Germany! But that is only a coincidence! You all know I am totally in love with my colored pencils at the moment. Today I wanted to color on kraft cardstock and I love how vibrant the colors turned out! Don't you? 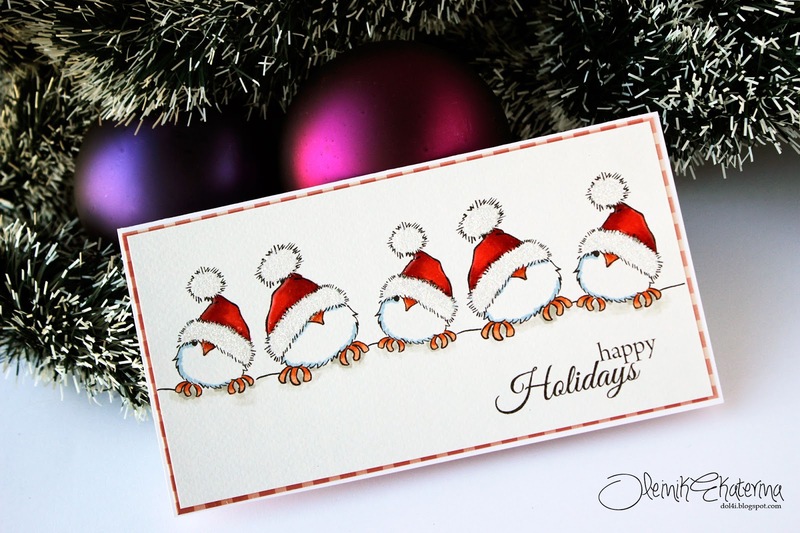 Stamp and color the snowman! Add the cup and color it, too! Mask of the area in the middle of the card and stamp the border! Add some ink to the edges to make the border more defined! Add the chipboard - and ready! An easy and fast card! I got the kraft paper from Christine and it is perfect for coloring: It is more on the rough side! That makes it possible to add more layers of color and you get a more vibrant look! To add a little more interest I used some glossy accents on the nose, on the cup and on the buttons of the snowman, on the eyes I used enamel accents! To make the snowman pop, add a little bit of color around him and a shadow under him! It makes it look more realistic, too! My card is nearly a one layer card (apart from the chipboard)! Masking of an area and add a border is an easy possibility to add some dimension! Do you want to play with the awesome Create a Smile products, too? 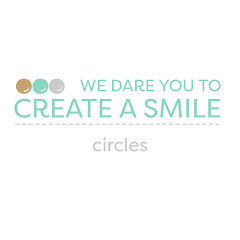 Then hurry up: Apply as a guest designer for Create a Smile here! So tell me! Did you get out your colored pencils and used them? Let me know your experiences! Samantha here, and today I'm sharing a card all about watercoloring and sending someone some good vibes and happy thoughts! I, like a lot of people, am still totally into the watercolor trend! And I'm in LOVE with the kind of loose watercoloring look, where the color bleeds past the edges! I just love it! So I knew I wanted to create a background of those amazing vintage radios in grey with that style! 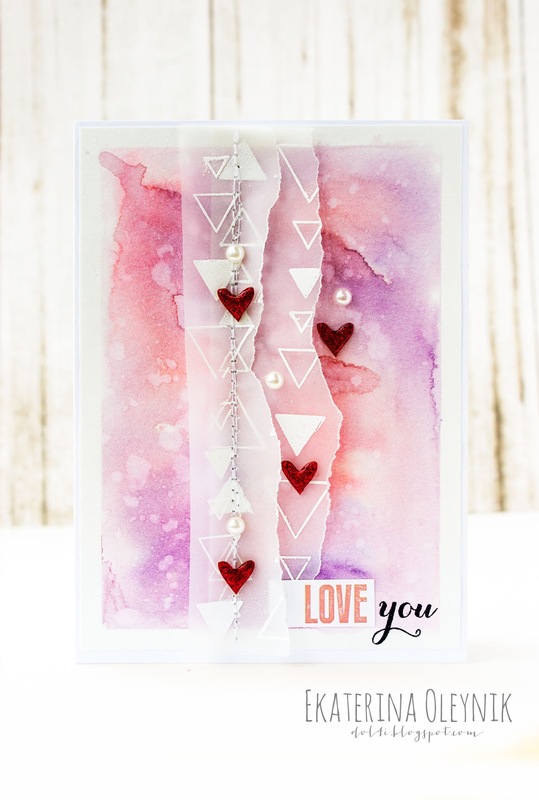 * Use Distress markers and a waterbrush to create the watercolor look! Be sure to move your brush with the color outside of the lines to get that cool 'loose' watercolor look! * Stamp the sentiment, stamp the sun image below the sentiment and add greys and yellows while wet so the watercolors bleed and blend together. * Add dimensional adhesive to the card front. I used the vintage radio image from the Perfect Tune. 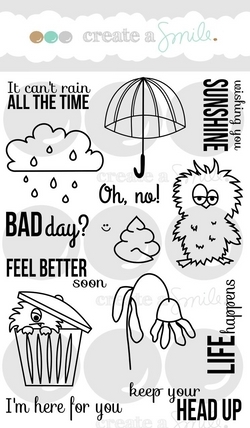 The sun is from Your View and the sentiment is a combination of phrases from Bad Day. For my card, I added gesso to the cardstock, so I could then watercolor without the warping. But you could just use watercolor paper, and get the same effect! Also, instead of a staz-on ink, you can always heat emboss your images, instead! It's that time again - we're looking for our March Guest Designer! Maybe it's YOU?!? 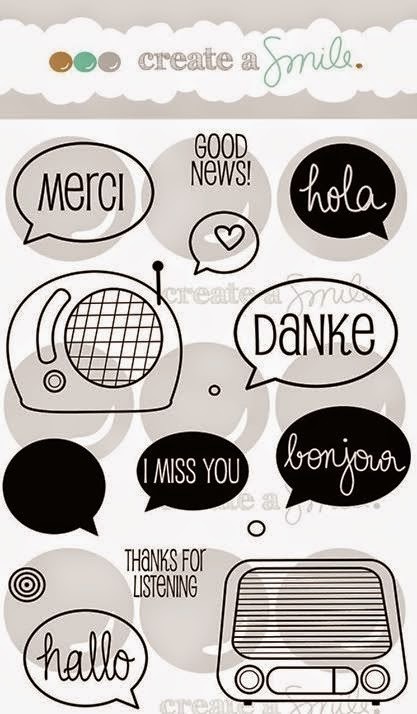 Create a NEW project (It can be a card, but you're no limited to that. 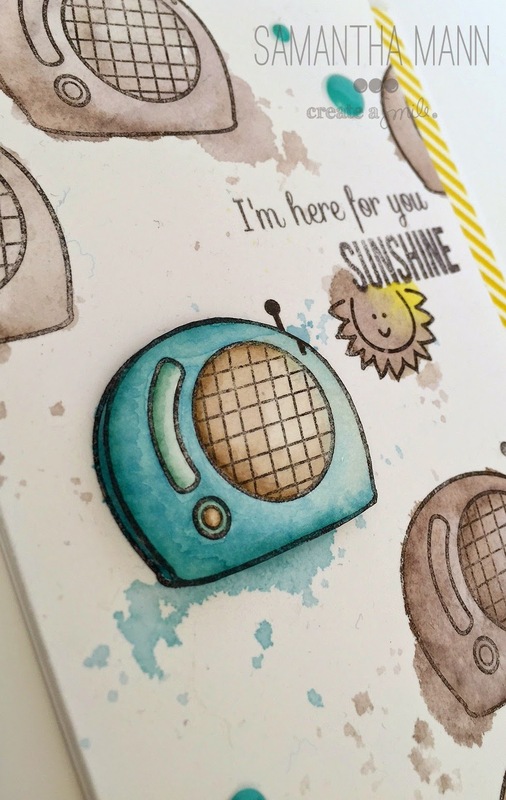 We LOVE to see inspiring art/decor/layouts/... that is "out of the box") with at least one of our stamps or freebies and post it on your blog. Feel free to combine with other stamps. 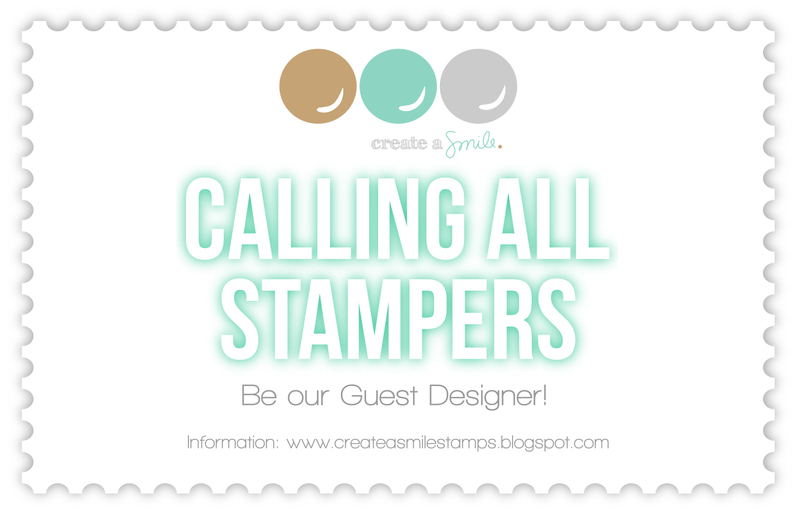 Add the "Calling All Stampers" badge to your post, tell your readers about our Guest Design Team spot and link back to this post. The linky tool closes on Friday February 13th at 8am CET (2am EST). Our Guest Designer will be announced on Saturday February 14th. Great Photography! I found out that cards that really catch my eye are usually the ones with the best photos. You want your projects to SHINE so take your time to take great photos! That makes a bigger difference than you might think. 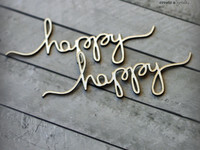 We're happy to welcome back the fabulous Vanessa Menhorn today for her third Guest Designer post. 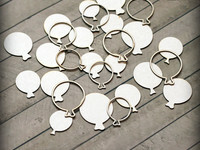 I love to have posts from different designers because everyoe comes up with completely different idea. 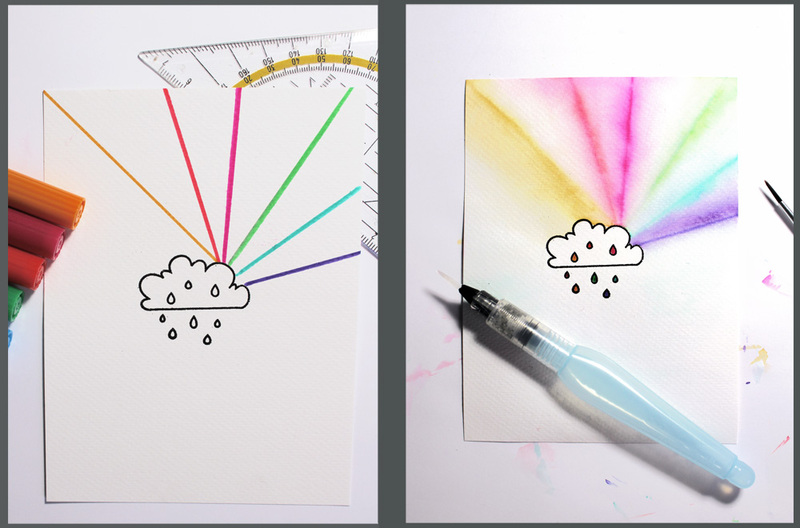 I would have have thought of this way to use watercolors! No rain - no rainbow. 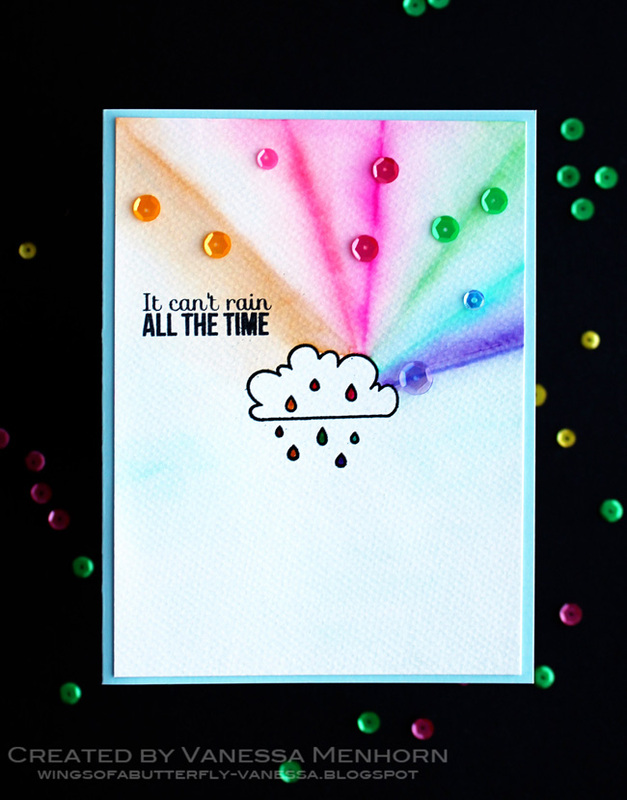 So I wanted to create a happy rainbow card to brighten someones day! Working with water will always warp the paper, even when using watercolor paper. I like to press my dried paper between books before adhering it to the cardbase. Thank you SO MUCH for being our guest and inspiring us, Vanessa - you're a gem! 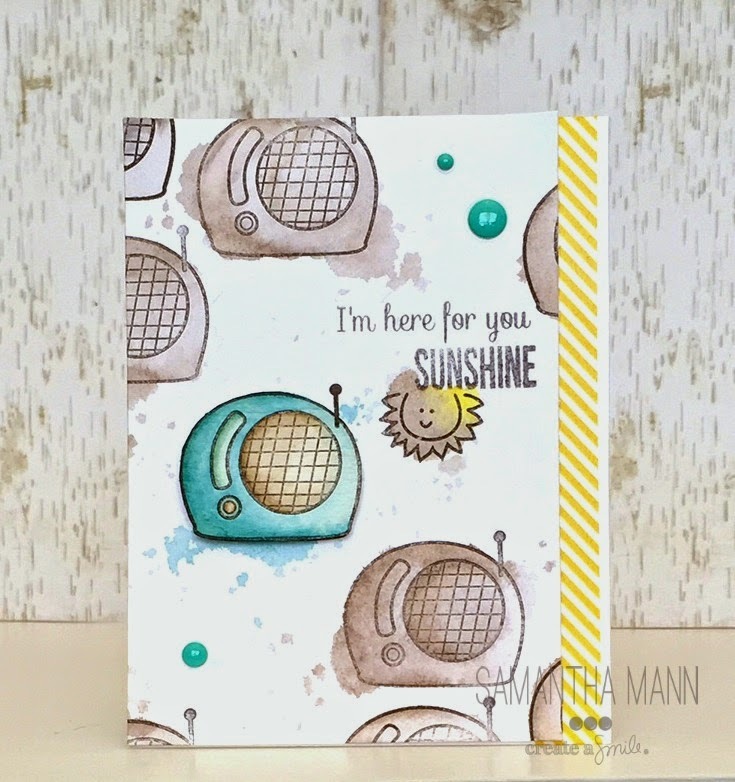 For this card, I wanted to create a background using a sentiment stamp instead of a stencil, what I would usually use for this kind of layout. I also wanted to play with two shades, black and yellow. It really pops against the white card base. Use sharp scissors to fussy cut a stamped image then use a black marker to run around the edges to give more definition. 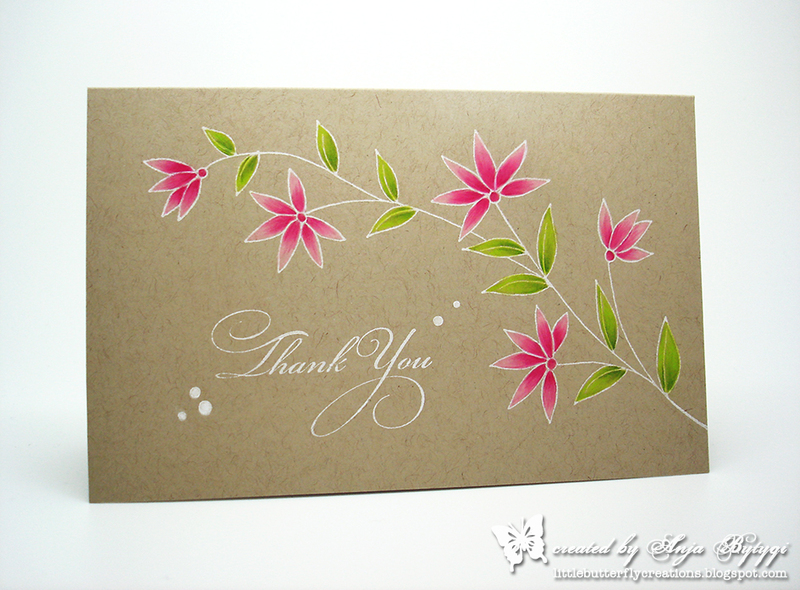 To create a background with a sentiment, you can also use the second generation stamping technique. 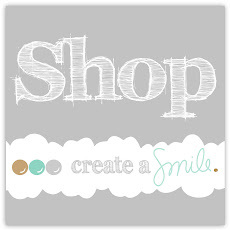 Now you can share your Create A Smile creations with us! Yay! Upload them right in the sidebar. It's pretty simple, I needed a lot of birthday cards :) However, I think you can make this design work for any occasion. A graduation, promotion, engagement, what have you. Grab some water color paper and swoosh some water on it however you want. Add your water colors. Watch the water make magic. While it's drying tie your twine to the happy chipboard and created a bow for your balloon. Once dry adhere both. Add sequins if you want, or don't. It'll be just as gorgeous without them. Done! You can switch your colors up to match your occasion. I think using school colors for a graduation or wedding colors for an engagement would be a fun way to personalize it. You can also color your chipboard if you don't like the "naked" look of it. Instead of a bow try a knot on the balloon for a more masculine look. Really there is no end to how you can change this up!! 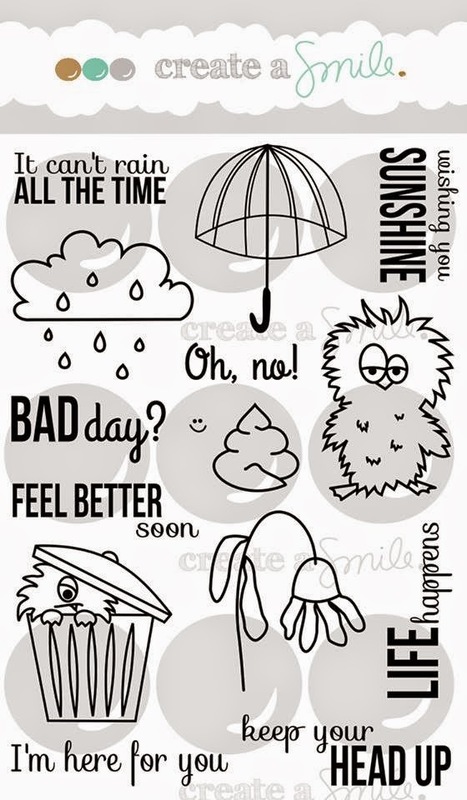 Bad Day? I am here for YOU! January Release Countdown #1 - GIVEAWAY TIME!